Since the time of oiled sand greens and Donald Ross, Pinehurst and nearby Southern Pines in North Carolina's pine barrons has been known as the "Go To" place for serious golfers. Like St. Andrews in Scotland, Pinehurst is on the "Bucket List" of avid golfers everywhere where golf is played on more than 40 courses including the eight championship tracks at Pinehurst Resort where the recently restored No. 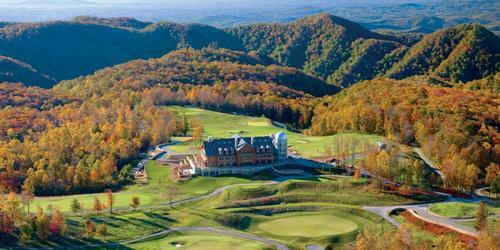 2 is the venue for the 2014 U.S. Open and U.S. Women's Open. In 1900 Donald Ross came to Pinehurst as head professional, going on to launch his golf design career (Pinehurst No. 1 - No. 4). The early 1900s brought America's first families like the Rockfellers, du Ponts, Morgans and Sousas to this newly created resort to escape winter chills, play golf, croquet and tennis, dine in the elegant Carolina Dining Room and rock in the chairs on the veranda. Amelia Earhart arrived in her own plane landing on the Pinehurst airstrip, Will Rogers came for polo and Annie Oakley, star of the "Buffalo Bill Wild West Show," gave shooting lessons. Pinehurst was the center of a lively social scene while golf attracted legends like Sam Snead, "Babe" Didrikson Zaharias and Ben Hogan. The buzz continues, especially with the restoration of Ross's Pinehurst No. 2, bringing it back to the way it was in the 1930s. The roughs have reverted to a sandy ground punctuated by wire grasses and the bunkers are once again shaggy-edged. Still Pinehurst's other tracks in no way take a back seat to famed No.2. Pinehurst No. 4, a well-framed Tom Fazio design, offers continuing choices and plenty of challenges. Paying homage to Ross, Fazio followed Ross's original routing but managed to create an entirely new golf experience, his Tribute to Pinehurst that opened in 2000. No. 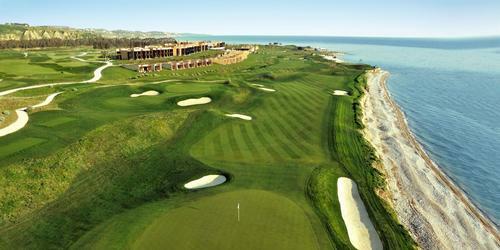 4 has a wide-open feeling plus a lot of sand with more than 140 pot bunkers along with sprawling waste bunkers. No. 7, a Rees Jones design, isn't just another pretty layout with ponds, trees and varied elevations. It's a course where women can beat the men especially if they play from the forward tees that on some holes appear to be in another state. A mile away from the Main Clubhouse, No. 7 sits on some of the area's most rugged land. The Centennial Course No. 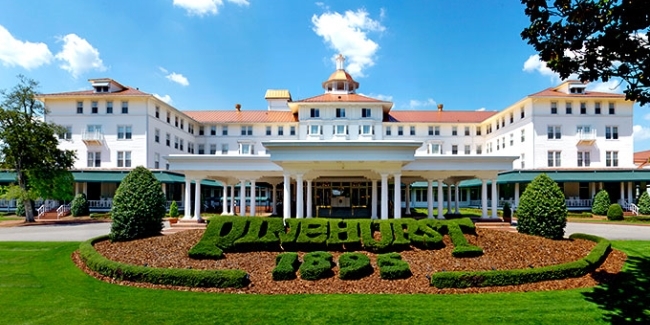 8, opened in 1996 to commemorate Pinehurst's 100th year. Tom Fazio incorporated signature Ross features into his design, including dips and swales around the greens, sloping greens and false fronts. 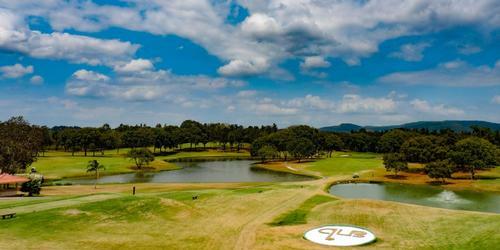 This is a favorite of low and high handicappers alike with hole-after-memorable hole. For example hole #4 seems desert-like, open with huge sandy waste bunkers; others wind through wetlands and groves of pines. Among the many fine courses nearby are two more exceptional Ross designs, Mid Pines and Pine Needles Lodge & Golf Club. Under the leadership of Peggy Kirk Bell, owner of Pine Needles and Pro Pat McGowen, Pine Needles' golf school covers all aspects of the game from the full swing to the short game, mental management and video analysis. Forest Creek 's Tom Fazio-designed South and North Courses, Talamore Golf Resort designed by Rees Jones, the Mid South Club crafted by Arnold Palmer and the quirky Tobacco Road course, a Mike Strantz masterpiece are also highly touted. Reigning over the Pinehurst Resort scene is the historic Carolina Hotel (often called "The Queen of the South"). Since it opened in 1901, much is the same. Rocking chairs line the long porches, tree-shaded paths lead into town, and the delicious biscuits and gravy in the Carolina Room greet breakfast goers while Southern hospitality treats golfers to a seamless flow of services. Tell the bellman where you're playing and your tee time, and your clubs will be at the right course ready to go when you arrive. A shuttle ferries you back and forth. And much is new. Renovated rooms are decorated with earthy colors of tans, cream and khakis; bathrooms feature marble vanities and shower rain-heads the size of dinner plates plus you get flat screen tvs and minibars. 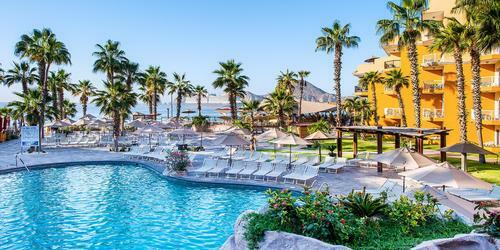 A 31,000 sq. ft.. Spa and Golf Fitness Center with a sparkling three-lane lap pool, offers more than 40 treatments including the popular Hot Stone Massage, Magnolia Facial and Champion's Massage for golfers. Pinehurst Resort's several restaurants located in the Carolina, Manor, Holly Inn, and clubhouses continue to please diners with a range of cuisine and dining style from the more formal dining room in the Carolina to The Tavern, a Scottish-style pub in the Holly Inn, a great place to unwind after golf. In addition to the stately white Carolina, a National Historic Landmark, lodging choices include on-site villas and the Holly Inn as well as the history-rich Pine Crest Inn (1913) right in the center of town with a few rooms and a lot of history. Sit in a rocking chair on the porch and watch the world go by; have a candlelit dinner in the dining room; and down a few brews at Mr. B's Lounge, the lobby bar which has been called "among the great watering holes in all of golf." Condominium-style accommodations are found at Pine Needles Lodge & Golf Club where the low-rise rustic exteriors blend into the surrounding pines and at Mid Pines Inn & Golf Club, you stay in a three-story gracious old inn with comfortable, traditionally furnished rooms. Pinehurst itself is a charming small village with pubs, boutiques, cafes and shops along with several places to eat and drink and many historic sites. Even if you don't play golf, sitting outside on the patio at the Holly Inn on a warm day sipping a cool drink, is a treat all by itself. Just down the road Southern Pines has a number of places to eat including the Southern Prime Steakhouse housed in a restored historic building where the ambiance is sophisticated, the steaks perfect and the wine list outstanding. Katharine Dyson is a freelance golf and travel writer, author, and columnist for several national & international publications and websites as well as guidebook author and blogger. Realizing that a golf and travel writer is the most underpaid, over privileged profession on the planet, she embraces the life style traveling all over the world to play golf and check out resorts. She is a member of the Golf Writers Association of American, Golf Travel Writers of America, the Society of American Travel Writers, and Metropolitan Golf Writers Association.